This week's life lesson? Just because you can do something, doesn’t mean you should. Case in point: I was browsing the site of a company I really like the other day, when I stumbled upon the image you see to your right. Take a nice, long look. Wanting to provide website visitors with a personalized experience, the site has likely leveraged our company IP address or Whois data to integrate tidbits of visitor-specific information into our experience. Trouble is ... that info is way off. Bigger trouble? It doesn't actually help me get to where I'm going or otherwise improve my experience. Tailored one-to-one marketing can be an amazingly productive thing, but just be careful that you're not doing so prematurely. Don't personalize before you've got good data. Who hasn't ever received a personalized email with errors in it? Stories abound of emails beginning with "Dear first name," or featuring a glaring misspelling. I'm ashamed (but not too proud) to admit that we've had a few examples of that in our own email history. One of the ground rules for personalization -- and it spans from email to website -- is that you've got to be sure you've got good data fueling it. Make sure your data is ready before you actually incorporate personalization as a marketing strategy. Even when you have good data, it can be tough to eliminate every issue, but the following steps will help you safeguard against an embarrassing personalization error. Clean Your Database: Periodically run reports to make sure your data isn't corrupted by common errors. For example, when we want to personalize by company, we try to clean the data first by running a report on any lead who has listed their company as "none." Safeguard Your Form Fields: When you're gathering data through forms on your site, think about which fields you'll be using in personalization, and require those. In some software, you can also use form validation to safeguard against misspellings and bad data. Don't personalize before you've got a good reason. Marketers shouldn't be personalizing content for the heck of it. Sure, it was off-putting that the personalization example at the top got our company location and spelling wrong, but it was even more annoying that there didn't seem to be any actual purpose for that personalization. My location had nothing to do with my reason for visiting the site, nor did the fact that we're not a Fortune 1000 company. Personalization without a good reason breaks the cardinal inbound rule: Marketing should be driven by the prospective customer's needs. At its core, marketing should be useful. So, what are some good reasons for personalizing? To Make Conversions Easier: It's a total pain to fill out forms again and again, and if you already have the information about the lead, it's unnecessary. Instead of putting your leads through that rigmarole each time, personalize your forms to remove any fields for which you already have the data. To Address Their Interests: More on this below, but use what you know about past downloads and activity to help elevate content that your prospective customer might find interesting. "When online shoppers were simply looking at a product category, ads that matched their prior web browsing interests were ineffective. However, after consumers had visited a review site to seek out information about product details -- and were closer to a purchase -- then personalized ads became more effective than generic ads intended for a mass audience." It's not that early personalization is harmful, per se -- it just may not be quite as effective. Better to place your personalization efforts closer to the point of decision and in ways that it will be most useful for the decision-maker. Be careful about personalizing too much. We all want content that's relevant. But there's a balance that must be maintained as a marketer in how much personalization you use. Eli Pariser, author of "The Filter Bubble," suggests that targeting content too much to the individual can lead to a limited perspective. He says, "Hearing your own views and ideas reflected back is comfortable, but it can lead to really bad decisions -- you need to see the whole picture to make good decisions." Larger data seems to back that up. In a survey by the Pew Internet & American Life Project, 65% of 2,000 respondents said they don't like personalized search because "it may limit the information you get online and what search results you see." 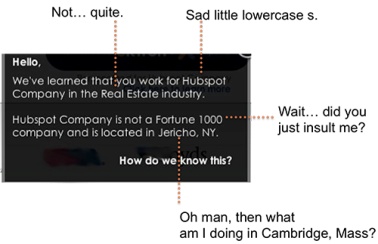 To use HubSpot as an example, just because the first piece of content you downloaded from our site had to do with social media doesn't mean that every email we send from then on should be about social. In the example below from our contacts database, the browsing history of one of our leads clearly shows a natural meandering and evolution in the lead's interests over time. Personalizing too much would restrict that lead in learning everything he wants. My goal in this post is not to make you shy away from adding personalization to your marketing. On the contrary, I'm a big fan of content that dynamically adapts to be more relevant (Look, I even wrote an ebook on it!). I simply want to underscore how important it is to be intentional about your personalization strategy. Make sure you're doing it in the right way, for the right reasons. Curious to hear from all of you -- what examples of really good/bad personalization have you seen in marketing?